The main star of this show is the yellow fabric, with supporting roles played by red and black. And, if you take a closer look at the fabrics, you might see where I derived the name for this quanket. I dug through my scraps bins to use up as much red and black as I could, but still had to rely on a couple of newer fabrics to have enough in the color palette I chose. I enjoy using up scraps not only for the reason of clearing up space in my scraps bins, but moreso for the memories they bring me as I work with them, reminding me of where I had previously used the fabrics, and/or where I had gotten them. This is another of the many variations of a 9-patch block, and is a pattern I had used a longtime ago in my Who Let the Dogs Out quanket. I like the fun playfulness of not only the design, but the fabrics as well. This was donated to the County of Ventura, Children & Family Services, for a child in foster care in July 2018. 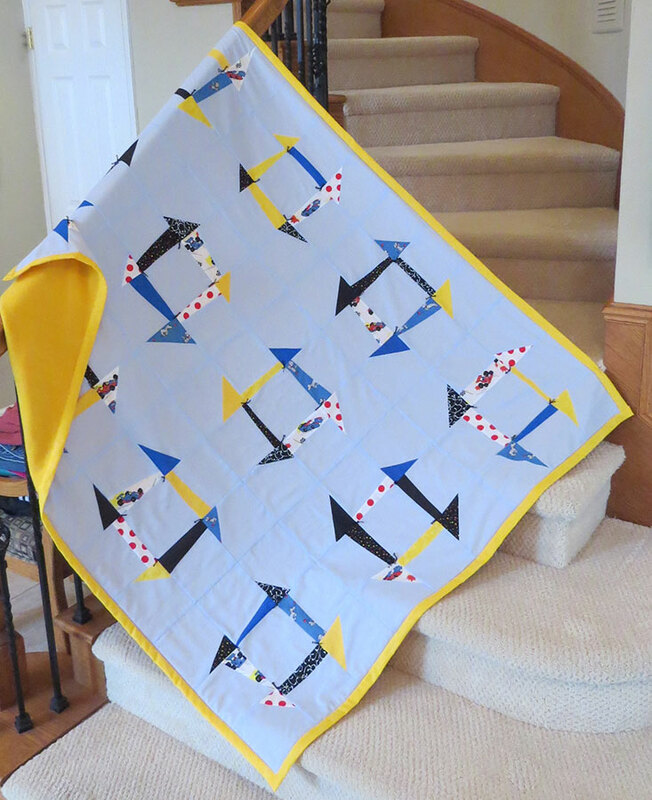 ‘Start Your Engines’ is a fitting quip for the New Year, and for this quanket that uses a fun race car fabric! Several months ago on another post, I made a comment about how many traditional quilt designs are variations of a 9-patch. Well, here is a modern design that is also a variation of a 9-patch. Ya gotta love the 9-patch for its versatility! If you look through the quilts I have created, I sort of am all over the place in regards to style(similar to my wardrobe – all over the place 😉 ) I am style agnostic: I like modern, traditional and contemporary. While I really like modern quilt design, I tend to shy away from it since many designs predominately use white as a background color. 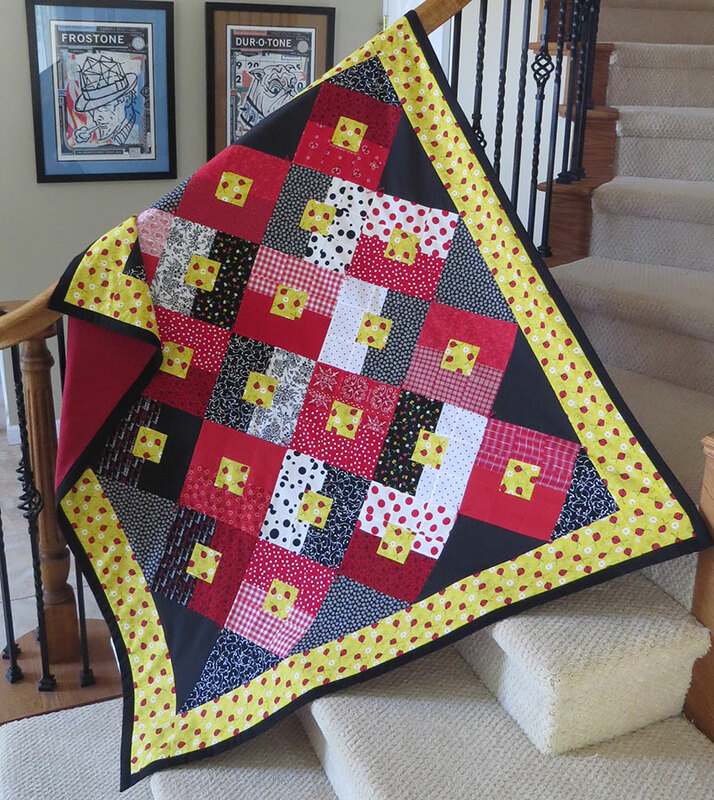 I love the choice of white for its high-contrast value, but since I make these quilts for kids, I fear that white fabric is not going to go the distance. So instead of white, I use other colors for my backgrounds to help convey the modern feel. This was a super fun, quick design that can be put together in less than a day. It is also a good scraps-buster project, especially if you have wonky-shaped scraps. The blue background fabric was some I had inherited from Edith and the race car fabric was given to me by a close friend. Most of the others were pulled from my scraps bins. There are a lot of ‘pieces of the past’ fabrics that were used in this quanket! This was donated to the County of Ventura, Children & Family Services, for a child in foster care in April 2018. Do you ever purchase a super cute fabric that you just can’t resist, but then find that it sits in your stash, and for some reason, you seem to be avoiding it? In this case, the fabric is a beautiful Julia Cairns African inspired design. Each time I saw it there in my stash, beckoning me, I wasn’t quite sure how to do justice to the fabric, as each of the animal blocks is a different size. But then the idea finally came to me: a 9-patch might be the answer. A standard 9-patch is such a perfect block pattern because it so flexible. The color palette was pulled from the animal print – blues, gold and greens – taken from a variety of leftover pieces from other past quanket projects. Worrying is carrying tomorrow’s load with today’s strength – carrying two days at once. It is moving into tomorrow ahead of time. Worrying does not empty tomorrow of its sorrow; it empties today of its strength. This quanket was donated to the County of Ventura, Children & Family Services, for a foster child in June 2016. The design for Madagascar Foxtrot is based off of a basic 9-patch quilt. This one is a true patchwork quilt as I used scraps that were left from these prior Love Hugs quilts – Check This!, Shooting Star and Green Tetons. And, I still have more of these fabrics! 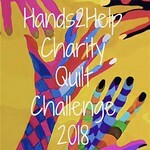 If you would like to donate a scrap of fabric to be used in a Love Hugs quilt, check out the donation form on the About page. Silky Lizard was donated to the County of Ventura, Children & Family Services, in March 2014.